Thyme is a perennial herb that has graced Greece with its tiny purple flowers and green-silver colour for centuries. It was originally used as a gift to the gods, as its name comes from a greek word that means “to sacrifice”. Due to its antiseptic properties, the oil in thyme was used in WW1 to treat soldier’s injuries. Great in stews and as a accent for fish, meat, egg dishes and vegetables, thyme has a respected place in the kitchen. It goes well with rosemary, and is excellent in butters and bread. Traditionally, thyme is used in clam chowder, scotch broth, and other soups. Aromatherapists use thyme for its calming effect and the ability of thyme to heal many different ailments is legendary. Thyme has a woody, hardy root and sturdy stems. It can grow five to ten inches high. Its leaves are paired on the stem, and the small thyme blossoms range from purple to white. Thyme can be grown from root divisions or cuttings from early summer, or planted from seed, in containers or directly in the ground. Plant six inch cuttings in good light at springtime. Thyme likes sandy, light, well-drained soil. If starting from seed, plant the seeds two inches apart in soil 1/4 inch deep. Compost is very beneficial in the spring. Low growing varieties are sometimes planted in the cracks of paving stones or crazy paving; thyme also settles nicely in the rock garden or alpine garden. As well, plant herbaceous thyme as a dense, low ground cover in flower borders or to fill sparse, sunny spaces. Leaves can be picked as necessary, as the leaves of thyme are the parts most used for cooking and healing purposes. To harvest more of the plant, cut the herb three inches above the ground in summer right before flowering, and dry the plant accordingly. Thymol is the oil extracted from thyme, and was traditionally used to effectivly kill germs. Herbal thyme tea is great for nervous and circulatory problems, as well as fighting off colds. This herb is good for asthma and coughs as it is antspasmodic, and promotes the flow of mucus. 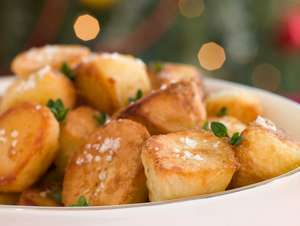 Place quartered potatoes in a bowl; drizzle with olive oil and sprinkle with thyme and garlic. Toss potatoes to cover well. Spread potatoes in a baking pan, and roast until potatoes are golden brown, turning once or twice. Serve with salt and pepper and, if desired, garnish with additional sprigs of thyme. Combine the flavors of parsnips, apples and thyme in this British-inspired recipe for Parsnip Apple Thyme Soup , shown at right, by the TheEnglishGarden blog. If you like ginger as well, consider trying this recipe for Apple Parsnip Ginger Soup, which includes the addition of three sprigs of thyme. From the SophisticatedGourmet, check out how to make Roasted Tomato and Thyme Soup with slow roasted flavors of garlic and thyme, topped by sour dough bread, mozzarella and snipped chives. The Real Mushroom Soup, by Jamie Oliver, promises to be unlike any mushroom soup you’ve ever tasted before; made from a mix of wild mushrooms (chanterelles, oyster, shitake etc. 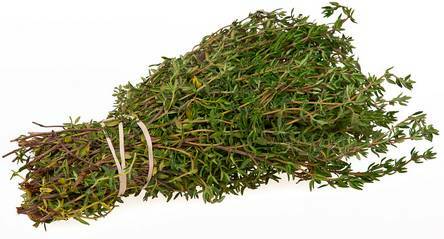 ), it includes a handful of fresh thyme sprigs with leaves removed. Tips: Try adding thyme to canned tomato soup for a fast flavour boost; it is also a natural addition for chicken noodle or French onion soups. Pep up beef stew, Irish stew, sausage stew, or any tomato-based soups with half a teaspoon of dried thyme, or 1 to 2 teaspoons of fresh diced thyme. Adjust the amounts to suit your own taste.